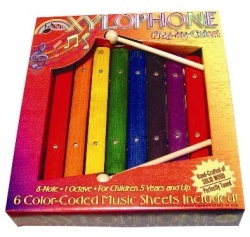 Made by First Note, this 8 note xylophone is handcrafted from solid wood for a true xylophone sound. The easy to learn color method makes it fun and rewarding. Just follow the 6 color coded music sheets inside. One octave from C to C. Includes mallets.